N 44° 15' 34" and W -76° 22' 52"
Eastview in Ontario is a town in Canada about 86 mi (or 139 km) south of Ottawa, the country's capital city. Current time in Eastview is now 11:24 PM (Sunday). The local timezone is named America / Toronto with an UTC offset of -4 hours. We know of 9 airports near Eastview, of which 3 are larger airports. The closest airport in Canada is Kingston Norman Rogers Airport in a distance of 11 mi (or 18 km), West. Besides the airports, there are other travel options available (check left side). Also, if you like playing golf, there are a few options in driving distance. We discovered 10 points of interest in the vicinity of this place. Looking for a place to stay? we compiled a list of available hotels close to the map centre further down the page. When in this area, you might want to pay a visit to some of the following locations: Watertown, Oswego, Lowville, Syracuse and Canton. To further explore this place, just scroll down and browse the available info. Let's start with some photos from the area. Start of the poker run in Kingston's Harbor. Confederation Basin Marina, City of Kingston Cigarretas en Kingston Ontario Canada. Pre-judging comparisons. I won the Heavies and the Overall. 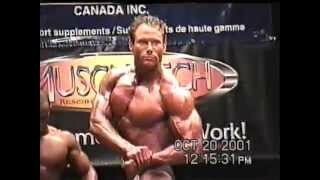 Kingston was the first bodybuilding show I saw and had always wanted to compete there. When I did I killed it! The Cataraqui River forms the lower portion of the Rideau Canal and drains into Lake Ontario at Kingston, Ontario. It is also known as the Great Cataraqui River or the Greater Cataraqui River to distinguish it from the smaller Little Cataraqui Creek, 4.5 km to the west. The Cataraqui River system was extensively modified during the construction of the canal: swamps were turned into lakes and new marshes were formed. Located at 44.2619, -76.4672 (Lat. / Lng. ), about 4 miles away. The Royal Military College of Canada, RMC, or RMCC, is the military academy of the Canadian Forces, and is a degree-granting university creating Officers, well educated. RMC was established in 1876. RMC is the only federal institution in Canada with degree granting powers. The Royal Military College of Canada Degrees Act, 1959 empowers the College to confer degrees in Arts, Science, and Engineering. Located at 44.2289, -76.4686 (Lat. / Lng. ), about 5 miles away. The Rush–Bagot Treaty or "Rush-Bagot Disarmament", was a treaty between the United States and Britain limiting naval armaments on the Great Lakes and Lake Champlain, following the War of 1812. 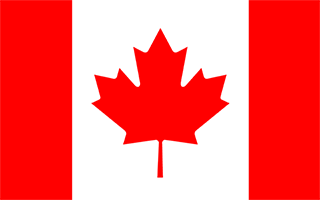 It was ratified by the United States Senate on April 16, 1818. , and has been confirmed by Canada, following Confederation in 1867. The treaty provided for a large demilitarization of lakes along the international boundary, where many British naval arrangements and forts remained. Located at 44.2299, -76.4663 (Lat. / Lng. ), about 5 miles away. This article is about the Canadian Army base. It should not be confused with the historic RCAF Station Kingston. 50x40pxThis article needs additional citations for verification. Please help improve this article by adding citations to reliable sources. Unsourced material may be challenged and removed. Located at 44.2399, -76.4481 (Lat. / Lng. ), about 4 miles away. Fort Henry (also known as Fort Henry National Historic Site) is located in Kingston, Ontario, Canada on Point Henry, a strategic point located near the mouth of the Cataraqui River where it flows into the St. Lawrence River, at the upper end of the Thousand Islands. The original fort was constructed during the War of 1812, when present-day Ontario was a British colony known as Upper Canada. Located at 44.2303, -76.4597 (Lat. / Lng. ), about 4 miles away. Fort Frontenac was a French trading post and military fort built in 1673 at the mouth of the Cataraqui River where the St. Lawrence River leaves Lake Ontario (at what is now the western end of the La Salle Causeway), in a location traditionally known as Cataraqui. 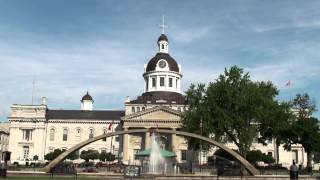 It is the present-day location of Kingston, Ontario, Canada. Located at 44.2333, -76.4786 (Lat. / Lng. ), about 5 miles away. The RMC Paladins are the athletic teams that represent Royal Military College of Canada in Kingston, Ontario, Canada. Team colours are red and white. Its facilities include: Kingston Military Community Sport Centre (KMCSC) with seating for 3737; Navy Bay fields with seating for 800; Constantine Arena with seating for 1500 and the Birchall Pavilion. Wolfe Island is an island at the entrance to the Saint Lawrence River in Lake Ontario near Kingston, Ontario. Wolfe Island is part of Frontenac County, Ontario and the Township of Frontenac Islands. It is the largest of the Thousand Islands. The largest community on the island is Marysville. The island was part of the traditional hunting lands of the Tyendinaga Mohawk people and the original name of the island is Ganounkouesnot ('Long Island Standing up'). Located at 44.1667, -76.3667 (Lat. / Lng. ), about 6 miles away. Howe Island is an island located in the St. Lawrence River west of Kingston in Frontenac County, Ontario, Canada. It is part of the Thousand Islands chain. Together with Wolfe Island and Simcoe Island, Howe Island is part of the township of Frontenac Islands, created through municipal amalgamation in 1998. Howe Island measures 13 km (8 mi) long and 5 km (3 mi) wide and has an area of 31 km² (12 mi²). The main channel of the St. Located at 44.2703, -76.2836 (Lat. / Lng. ), about 5 miles away. 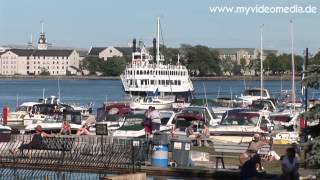 The Kingston, Ontario Inner Harbour is situated at the south end of the Cataraqui River northeast of the downtown core of Kingston, Ontario, Canada. It is the section of Kingston Harbour that is north of the La Salle Causeway. Located at 44.2363, -76.4738 (Lat. / Lng. ), about 5 miles away. Anglin Bay is a small bay on the western shore of the Cataraqui River at Kingston, Ontario. It is a prominent feature of the Kingston, Ontario Inner Harbour. The Bay was named for the S. Anglin Fuel Company whose Company offices and mill were continuously located on the shore of the Bay from 1865 to 1999. The S.
Located at 44.2391, -76.4797 (Lat. / Lng. ), about 5 miles away. Cartwright Point is a cape and neighbourhood in Kingston in eastern Ontario, Canada. Located east of the city's downtown along the St. Lawrence River in the former Pittsburgh Township, it is bordered by Deadman Bay on its western side, and faces Wolfe Island on its southeastern side. Off the southern tip is Cedar Island and one of Kingston's four Martello Towers. 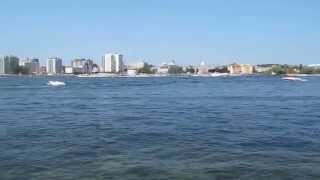 Cartwright Point offers excellent views of the Thousand Islands and historic Fort Henry. Located at 44.2311, -76.4475 (Lat. / Lng. ), about 4 miles away. The Kingston Royal Naval Dockyard was a Royal Navy Dockyard from 1788 to 1853 in Kingston, Ontario, Canada, at the site of the current Royal Military College of Canada. Fort Frederick is a historic military building located on Point Frederick on the grounds of the Royal Military College of Canada (RMC) in Kingston, Ontario, Canada. Its construction dates to 1846 and the Oregon crisis. The fort consists of earthworks surrounding a Martello tower. Fort Frederick is included in two separate National Historic Sites of Canada: Kingston Fortifications National Historic Site and the Point Frederick Buildings National Historic Site. 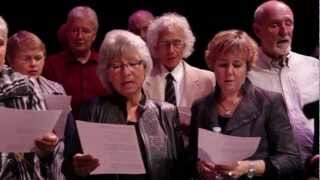 Garrison Golf & Curling Club is a golf and curling club, located within CFB Kingston in Kingston, Ontario, Canada. Garrison is a private club, primarily for the use of Canadian Forces personnel and Canadian Department of National Defence employees, although civilians are also eligible to join. The Curling Club was established in 1961 with four sheets of ice, which it has operated since that time. The Golf Club began in 1971 with the first nine holes, designed by Richard H.
Located at 44.251, -76.449 (Lat. / Lng. ), about 3 miles away. See also Lasalle Secondary School for the school in Sudbury, Ontario. La Salle Secondary School is a high school located in Kingston, Ontario, Canada. La Salle is a medium-sized school, consisting of an average student count of 700. The school schedule is composed of four courses and MSIP. The student body is predominantly composed of students from the adjacent suburbs, the military base, as well as many rural communities located along or near Highway 2, and Highway 15. Located at 44.272, -76.406 (Lat. / Lng. ), about 1 miles away. Cathcart Tower is a Martello tower located on Cedar Island in the St. Lawrence River, off the eastern shore of Fort Henry in Kingston, Ontario, Canada. It is one of four such towers built in the 1840s to protect Kingston's harbour and the entrance to the Rideau Canal. The other towers are: Fort Frederick, Shoal Tower, and Murney Tower. Built in 1848, this limestone tower is 11 m high and 16.5 m in diameter. Located at 44.2254, -76.454 (Lat. / Lng. ), about 4 miles away. The La Salle Causeway is a causeway that allows Highway 2 to cross the Cataraqui River (the southern entrance of the Rideau Canal) at Kingston, Ontario. The causeway separates Kingston's inner and outer harbours. Construction of the causeway was completed on April 15, 1917. Three bridges are incorporated into the causeway, the center one being a Strauss trunnion bascule lift bridge designed by Joseph Strauss, designer of the Golden Gate Bridge in San Francisco. Located at 44.2347, -76.4746 (Lat. / Lng. ), about 5 miles away. Kingston Mills, located approximately 7 km north of downtown Kingston, Ontario, is the southern-most lockstation and one of 24 lockstations of the Rideau Canal system. Kingston Mills is a component of the Rideau Canal National Historic Site, and along with the rest of the Rideau Canal, is a World Heritage Site. The site is managed and operated by Parks Canada. Located at 44.2922, -76.4422 (Lat. / Lng. ), about 4 miles away. 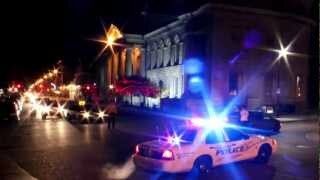 The Shafia Family murders took place on June 30, 2009 in Kingston, Ontario. Shafia sisters Zainab, 19, Sahar, 17, and Geeti, 13, along with Rona Amir Mohammed, 50, were found dead inside a car that was discovered underwater in front of the northernmost Kingston Mills lock of the Rideau Canal on the same day. Zainab, Sahar, and Geeti were daughters of Mohammad Shafia, 58 and his wife Tooba Mohammad Yahya, 41. The couple also had a son Hamed, 20. Located at 44.293, -76.4418 (Lat. / Lng. ), about 4 miles away. Eastview is a rural neighbourhood in the east end of Kingston, Ontario. It is located in the former Pittsburgh Township south of Ontario Highway 2, opposite Treasure Island on the Saint Lawrence River. Located at 44.26, -76.38 (Lat. / Lng. ), about 0 miles away. Ravensview is a community in Ontario. Located at 44.243, -76.423 (Lat. / Lng. ), about 2 miles away. Currie Hall, is a hall within the Currie Building, which is an annex to the Mackenzie Building at the Royal Military College of Canada in Kingston, Ontario. It was built in 1922, and is a Recognized Federal Heritage Building. The hall was designed by Percy Erskine Nobbs and built just after the end of the First World War by Sir Archibald Cameron Macdonell while he was commandant of the Royal Military College of Canada. Located at 44.2303, -76.4679 (Lat. / Lng. ), about 5 miles away. The Royal Military College of Canada in Kingston, Ontario Canada includes three chapels in Yeo Hall. RMCC Chaplain Services Department adhere to the direction of the Chaplain General's office; Minster to our Own, Facilitate the worship of others, Care for all. The Department shares in RMCC's intellectual life with guest speakers and forums, regular worship and seasonal celebrations. Point Frederick is a 41-hectare peninsula in Kingston, Ontario, Canada. The peninsula is located at the south end of the Rideau Canal where Lake Ontario empties into the St. Lawrence River. Point Frederick is bounded by the Cataraqui River (Kingston Harbour) to the west, the St. Lawrence River to the south, and Navy Bay to the east. The peninsula is occupied by the Royal Military College of Canada (RMC). These are some bigger and more relevant cities in the wider vivinity of Eastview. A journey of a thousand miles begins with a cash advance.